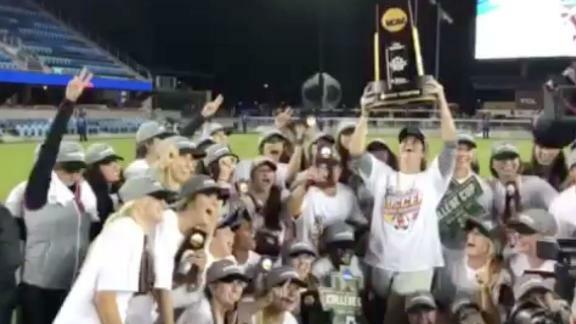 USC forward Katie Johnson explains how she scored two goals to win the Women's College Cup championship game but not before being drenched in water and Powerade by her teammates. Julie Foudy and Jenn Hildreth of espnW explain how USC took advantage of the few shots they were given to defeat West Virginia 3-1 in the Women's College Cup. USC coach Keidane McAlpine explains how well his offense did but is especially proud of his backline play to win the Women's College Cup. SAN JOSE, Calif. -- Katie Johnson scored twice in the final 16 minutes to lead Southern California to a 3-1 victory over top-ranked West Virginia in the NCAA women's College Cup championship game Sunday at Avaya Stadium. "I felt like the goal against us was kind of my fault. I turned a ball over in the middle," said Johnson, a senior whose career was threatened two years ago by her second ACL knee injury. "I felt like I had to make up for that. I honestly just wanted to win." The second-seeded Trojans (19-4-2) also captured the national title in 2007. They are the fourth school to win multiple College Cup titles. "This group was a special group from Day 1 ... they just didn't know it yet," third-year USC coach Keidane McAlpine said. The Mountaineers (23-2-2) lost for the first time since a 1-0 setback to Georgetown on Sept. 18. West Virginia had a 17-game unbeaten streak snapped and allowed three goals for the only time all season. West Virginia outshot USC 21-8 and held a 9-1 edge in corner kicks, but trailed 1-0 just 1:22 into the game after a Morgan Andrews goal. "I thought we did a great job battling back, creating opportunities," West Virginia coach Nikki Izzo-Brown said. "This sport is cruel. At the end of the day we didn't finish and USC did." No one finished better than Johnson, who sat out last season while rehabilitating after ACL surgery on her right knee. She tore ligaments in her left knee in high school. Johnson, who also had the winning goal in USC's 1-0 semifinal win over Georgetown on Friday, was wide open in front of the net when Leah Pruitt took a pass up the left sideline, beat defender Easther Mayi Kith, and delivered a perfect cross. Johnson simply rolled the ball into the goal to the right of goalkeeper Rylee Foster. Johnson, selected the College Cup's most outstanding offensive player, scored again off an assist from Nicole Molen in the 87th minute. "Having an injury like an ACL injury is not fun," Johnson said. "I knew this team was going to be special so I worked really hard to come back. I wanted to get the national championship. I knew we could do it." "To have the weekend she had is more than fitting," McAlpine said. "Absolutely unbelievable." The Trojans got on the board in the second minute after Julia Bingham directed a corner kick to the top of the penalty box, where Savannah Levin headed the ball forward to Andrews, whose header from 5 yards eluded Foster. West Virginia's Ashley Lawrence, a member of the 2016 Canadian Olympic team, tied it at 1 in the 66th minute when she ripped a shot from the top left corner of the penalty box just inside the near post. The Mountaineers kept the pressure on goalkeeper Sammy Jo Prudhomme and the Trojans' defense most of the afternoon. "Sometimes the ball just doesn't go to the back of the net," Izzo-Brown said. "I thought we should have had three or four (goals). Lots of credit to Sammy." The Trojans joined North Carolina (21 titles), Notre Dame (3) and Portland (3) as the only multiple winners of the College Cup. USC won its 126th national team title on the same day its men's water polo team lost 10-8 to Cal in the NCAA final just 45 miles away in Berkeley, California. West Virginia, in its first College Cup final, was hoping to claim its first NCAA title in any sport besides its co-ed rifle team, which has won 18 national titles.